Another amazing introduction from the Walters Gardens, Inc. hybridizer Hans Hansen. 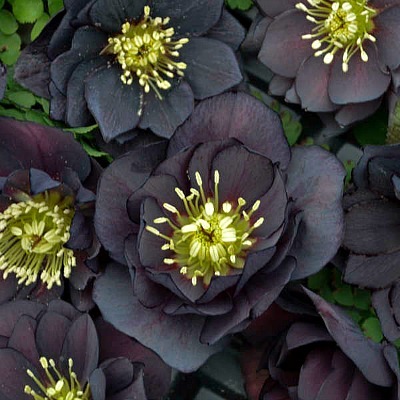 The Dark and Handsome Helleborus is part of the WEDDING PARTY™ series. The nearly black flowers are a beautiful contrast to the other bright members of the series. Plant this hellebore against other early yelllow flowering perennials or yellowish foliage plants. The evergreen foliage adds color and texture year round in woodland garden settings. The Helleborus Dark and Handsome opens with large 2 1/2 to 3 inch flowers often during Lent....which is why they are referred to as Lenten Rose. Create your own WEDDING PARTY™ planting several of the brilliantly flowering Hellebores. The First Dance Helleborus and the Maid of Honor Helleborus excellent companions. Hellebores are harmful if eaten and can cause skin irritations so be sure to wear gloves and protective clothing when planting and pruning. Helleborus Dark and Handsome is grown in a one gallon container. Orders shipping to CA or AZ will be bare rooted and root washed before being prepped for shipping. Thank you to Walters Gardens Inc for sharing this beautiful image.